If you're looking to scare up a really good costume come October 31, take some advice from Greg Nicotero. With "The Walking Dead" season five premiere drawing in a record-breaking 17.3 million viewers for AMC, there's no doubt that America has a continuing case of zombie fever. As the special effects creator, producer and sometimes director of "The Walking Dead," Greg Nicotero understands that it's the little details that can really make the undead come alive when the cameras roll. So it's no surprise Halloween is one of his favorite holidays. "I couldn’t tell you how delighted I am that everybody has finally gotten on board with me," Nicotero–whose Emmy- and Oscar-winning career spans almost three decades and hundreds of productions–says of the annual fright fest. "It’s almost better than Christmas. Christmas is only one day but in October we start celebrating Halloween the first of the month and every weekend there’s a new horror movie coming out, you have movie marathons, you have haunted houses – it’s astounding to me how much people celebrate Halloween." Having appeared onscreen in the series in full zombie (or "walker" as they called on "TWD") makeup, Nicotero says that "it’s the subtle touches that really add up to a complete look and what makes our zombies stand out." One of the biggest makeup mistakes Nicotero sees is a lack of color when creating a "dead" look. "When someone is doing a zombie makeup they tend to only use two colors: they use white pale and black around the eyes," explains Nicotero. "It looks a little skull-like but it doesn’t look realistic. When you look at your hand or your arm and you can see all the little blotches of red and yellow and brown – your skin is made up of a variety of different colors." Shading, he says, is the key. "What we do on the show is to paint the shadows first with something like a dark burgundy and then go over the whole thing with a color we call dead – which is a yellowish, jaundice color. When you are able to use a bunch a different colors it looks more authentic. If you have a bruise there are all those colors around it – purple and red – so I try to get people to look at reality and use colors that exist in nature." Nicotero advises to steer clear of liquid food coloring when creating fake blood. "Avoid the kind you get in the cake decorating aisle. The problem with liquid food coloring is that it stains. So if you put blood on yourself you will be pink for three days. What I recommend is to go to a bakery and buy powdered food coloring. Get red and yellow powdered food coloring and mix it with corn syrup. That gives you a really good mixture of fake blood. If you put a little liquid soap in the mix you’ll be able to clean it off easier. 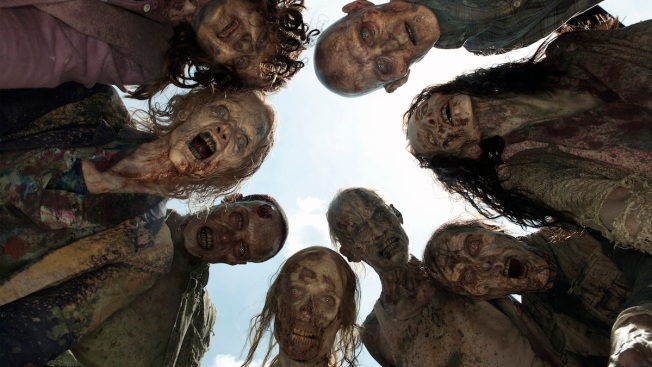 For the walkers on the show we add a lot of caramel color because we want our zombie blood to be a dark brown, which I think is more authentic." One mistake Nicotero regularly sees is how fake blood is applied. "People tend to apply it with a brush or as little droplets and it doesn’t look like it is coming directly out of a cut," he says. "It doesn’t convey any sense of how the would was inflicted. If you have a zombie with a giant neck wound, there’s not going to be just a little trickle of blood. There is going to be a lot of blood that has splattered – up under the chin, across the cheek, across its face – so you would believe that the walker that took the bite out of this person ripped the flesh out and the blood just sprays everywhere. It’s really important that when it comes to dressing the blood there is a sense of action, of violence to it." "Dirt plays a big part in our show – even for our survivors. We really make a concerted effort to make everyone look dirty. The thing about the walkers is we are able to make the skin look dull – the reason people’s skin is shiny is because they are sweating and they are alive. So when we are dealing with walkers the trick is to try and take as much life out of their faces as possible"
Keep the dirt coming advises Nicotero, and not just for the tattered clothing and ghoulish makeup. "For the zombies on our show the inside of the mouth is all dark because a pink mouth signifies that something is alive. So we use a mixture of food coloring and black cake icing and we swish it around in every zombie mouth before they get a close up." "What we put in all the zombies hair to make it look dirty and ratty is we use conditioner," reveals Nicotero. "It’s something that wasn’t done on a lot of zombie productions prior to this one. These zombies have been walking around in the sun for six, seven, eight months at a time. They have been rained on and dried in the sun and then rained on again, so their hair should look greasy and flat and matted down." "Nowadays you can go to any Halloween store and there is a lot of basic makeup supplies," adds Nicotero. "And one way you can get mummified skin is to use liquid latex. Get Kleenex or cotton and put a little bit of latex on your hand or on your face, then you put the tissue in there and model it into wrinkles. Then you take a hair dryer and dry it. Add another layer of latex and build it up to two or three layers. It is going to look dried out and weathered looking. Then thing to do is rip the tissue paper up and paint the wound red inside so it looks really nasty."